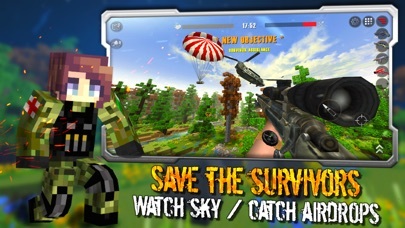 HunterСraft is a survival shooter for mobile devices. You are a hunter of monsters and mutants that are infested with the post-apocalyptic world. Open World, will provide a large number of locations in which you will need: save the survivors, defend your home, fight for territory with other players(PvP), destroy zombies, perform tasks for a while, earning coins, coupons, stars and other currencies. Your enemies are not only zombies and mutants, there are gangs in the game that are not averse to killing you and getting your loot. [Game process] You decide how to play. You can arm yourself with a machine gun or a shotgun and insolently shoot without interrupting the hordes. Or you can use stealth mode, hiding in the bushes and grass, moving through the trees and kill opponents unnoticed. Try not to get close to the zombies, you can get caught. Breaking away from the clutches of the monster will not be easy. [Exploration] Explore the world by going into the caves, search the abandoned houses and cars, find scattered resources and provisions. 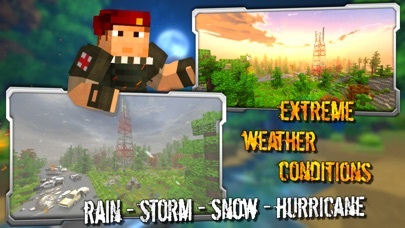 The game features a dynamic weather change system. At one moment the clear sun is shining, in a minute thunder and lightning can break out and rain will fall. Visibility is limited during rain or storm, be careful. At the point of contact with lightning, you can find interesting bonuses. [Rescue survivors] Save the survivors who need help. Protect the survivor from the monsters who want to dine them. Call a helicopter using a signal flare and immerse the survivors in a flight. [Interactive] Very flexible system settings graphics, sound and control. Intuitively convenient management and colorful graphics. The world consisting of blocks, cubes and voxels for the implementation of the sandbox and crafting. You can purchase blocks and build any building for housing. The world is completely destroyed, you can blow up a grenade and a hole is formed at the site of the explosion. Watch the sky, you can see the airdrop, or the plane that will inflict air strikes on your territory. [Features] Traps are a feature of the game, you can lure zombies into the bushes, before you put a trap there. You can mine the land of mines, to protect their territories. In your arsenal may be grenades, Molotov cocktail, stretch marks, nets and ropes. Also available are various skills and abilities: fast moving, high jump, crossbow climber and so on. [Crop] The game is fully accessible plant. Find or buy vegetable seeds. Dig beds and plant seeds in the ground. After some time, you will be able to collect the finished crop - vegetables and fruits. Which you need to eat to replenish health. 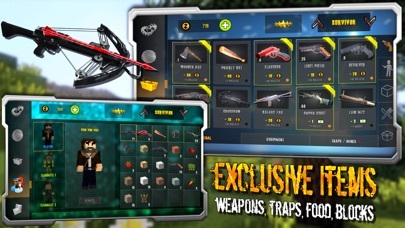 [Store & Cases] In the store you have access to many types of cold-blooded and firearms and traps. Weapons have modifications, for example: improved bullets, explosive bullets, incendiary bullets, and so on. About 100 types of building blocks. Some types of food: seeds, wheat, vegetables and fruits. Large selection of characters, skins for characters and skins for weapons. There are also cases, both random and permanent. In the cases you can find very rare skins, or weapons. 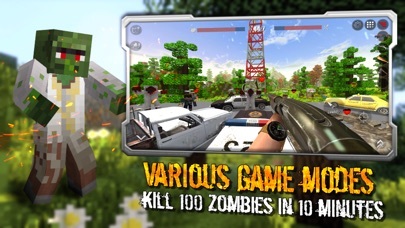 The game is a mixture of genres: shooter, exploration, sandbox and survival. The world is divided into locations scattered around the world. The game has many opportunities: to fight, save, complete quests and achievements, develop in ranks, build, destroy and so on. At your disposal are hundreds of items: Weapons, Traps, Food, Blocks, Vaccines. 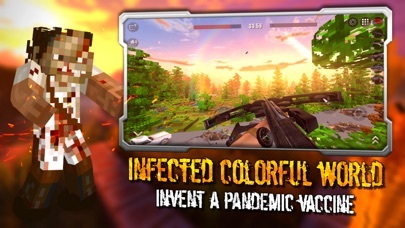 There is also a variation of game modes, such as: kill 100 zombies for a while, save the survivors, defend the territory from gangs, search for airdrop and rare plants, to create a vaccine. Play and enjoy.